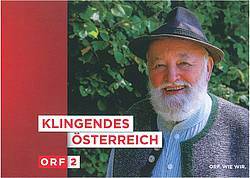 The 184th TV show "Klingendes Österreich" („Vocal Austria“) is dealing with natural and cultural treasures in the surroundings of the majestic mountain Reißkofel. Also, the Visitor Center of the Geopark was visited by Sepp Forcher and his team and was much impressed by its interior setting. .
On November 17, 2015 the Geopark Carnic Alps was designated as an official UNESCO Global Geopark. At this date 195 member states of the United Nations have approved the introduction of this new label. Based on this designation unique geological sites and landscapes have been officially recognized on a worldwide level. To date, 120 Global Geoparks occur in 33 states. More information here. In the last years extraordinary well preserved plant fossils were collected by Dr. Herbert Kabon from Villach during his collection campaigns in the Gailtal Alps and the Carnic Alps. A great deal of these plant imprints (ferns, sphenophyllales, horsetails, cordaites) has been donated for the Geopark. We invite you to have a look on the impressive rock slabs which is exhibited in the main building of the community Dellach/Gail. The rich fossil heritage of the Geopark Carnic Alps has recently been expanded by a new asset — the oldest traces of land-dwelling vertebrates in Austria. The first and hitherto only slab with Palaeozoic tetrapod tracks from Austria was discovered north of Kötschach-Mauthen in 1979. These tracks, compared to the ichnotaxon Ichniotherium cottae, were used to support the assumed Early Permian age of the footprint-bearing red-beds. The latter are known as the Laas Formation and represent the base of the calcareous Triassic to locally Cretaceous sequence of the Gailtal Alps. According to more recent studies, the ichnogenus Ichniotherium refers to trackmakers of the clade Diadectomorpha. It is a group of Late Carboniferous and Early Permian reptile-like amphibians that include some of the earliest herbivorous tetrapods on Earth. Diadectomorph fossil remains are known from Canada, the Czech Republic, Germany, Great Britain, Morocco, Poland and the US. The Kötschach-Mauthen specimen is the only potential record of this important and wide-spread group of terrestrial tetrapods in the whole Alps. In order to confirm the previous footprint report, the first two authors explored the Geopark Carnic Alps in 2013. A new site with reddish sand-, silt- and claystones of the Laas Formation yielded footprints of two more tetrapod ichnotaxa, Amphisauropus Haubold, 1970 and Dromopus Marsh, 1894. Potential producers of these traces are Seymouriamorpha, i.e. ca. 50 cm long reptile-like amphibians related to the Diadectomorpha, and early diapsids of similar size. The trace-bearing sediments are associated with invertebrate traces, root traces, mud cracks, ripple marks and microbially induced sedimentary structures characterizing floodplain fines within a thick series of alluvial fan deposits. The new footprint material supports the supposed Early Permian age of the Laas Formation and its interpretation as a continental basin of the eastern Alps almost 300 million years ago. Read for more information and photos under Research. The premiere took place in June 2014 in the school in Kötschach. Award for the Geopark Carnic Alps! 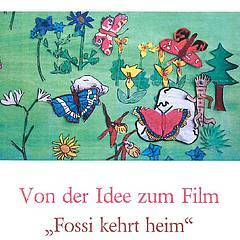 The competion „Agitating ideas for Carinthia“ was initiated by the Province of Carinthia and the Alps-Adria-University Klagenfurt. The Geopark intends with the project „Thoughtful moving“ to help people disabled by visual impairment. Along a trail different rocks from different Earth ages should be made hapticly understandable. Tactile markings and new media will be applied. What will really be made will be defined by the University. 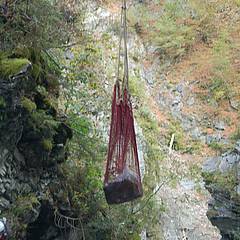 Thanks to many volunteers at the end of September 2013 a unique fossil-bearing rock slab could be recovered in the Mauthen Gorge. 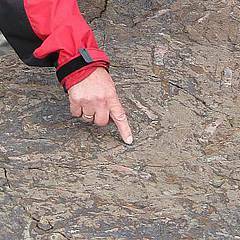 The interesting feature of this rock is its fossil content consisting of numerous up to 6 cm long tabulate corals of Devonian age distributed in the rock in a biostrome-like arrangement. The rock can be seen in the front of the Visitor Center. Petrified trees are Natural Monuments of world-wide significance. In the GeoPark Carnic Alps the petrified forest of Laas represents such an occurrence. Among others, the biggest fossil trunk of Austria is found here. 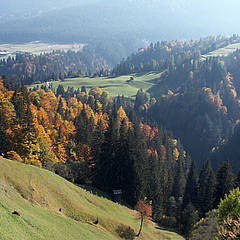 Exposing the trunks is financed by funds from the Austrian Program for the Development of the Rural Areas by the Austrian Government, the Province of Carinthia and the European Union. More about the petrified trees is found here. The results of the scientific study of the University of Innsbruck is found here. 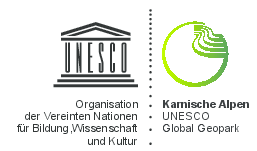 Since March 8, 2012 the Geopark Carnic Alps is official member of the European and global Geopark Network, supported from UNESCO. more. More about the European and global Geopark Network. At the beginning of 2011 the croos-border school project named “LivingStones” between Carinthia and the provinces Friuli-Venezia Giulia and Veneto was approved. 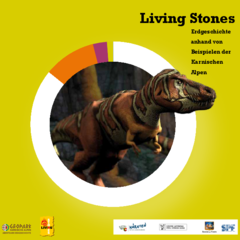 The project aims were the development of a brochure about Earth History including games, experiments and puzzles. 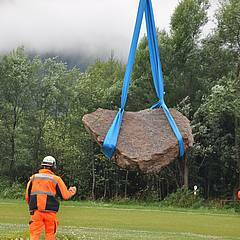 During August an erratic boulder was found in the Feistritz Creek during dredging. The boul-der comprises an ice-rafted rock composed of quartz-conglomerate which was moved with the ice to its present position. The abrasion suggests continuous reworking. 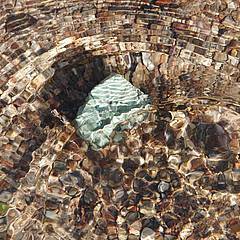 The rock testifies that 20,000 years ago the Gail Valley was filled with a several hundred meter thick ice shield. Another milestone for the development of the GeoPark Carnic Alps was signing the coopera-tion agreement between the GeoPark Carnic Alps and the Natural History Museum in Vienna (NHM) on July 15, 2010. The partnership with the biggest and most important Earth Science-related institution in Austria provides for the Geopark many benefits. During July 2010 the GeoPark in cooperation with the community of Kötschach-Mauthen was able to recover a fascinating relict from the last Ice Age in Laas.